The list of painters who can be called “the father of modern art” is one of art’s growth areas. It’s a role that used to be played by Courbet, whose painterly law-breaking was habitually cited as the precursor of impressionism. Then it became popular to trump Courbet with Goya, who was, after all, considerably earlier and wilder. My own tiny contribution to the field was made in a film called Manet: The Man Who Invented Modern Art. But now, a tad unexpectedly, the National Gallery has entered the jousts with a display investigating Delacroix and the Rise of Modern Art. It’s unexpected because Delacroix is a forgotten figure in exhibition circles. You don’t see shows about him any more. The last big one in Britain was mounted, I read, 50 years ago. So his modernity is something to which few of us can personally attest. There’s an added difficulty. His greatest and best-known paintings hang in the Louvre’s grandest gallery —the one devoted to French art of the 19th century — where their awesome size and noisy involvement in post-Napoleonic history makes them part of somebody else’s story. I don’t doubt that Liberty Leading the People is a great history painting. But it’s fully a French history painting. All this makes Delacroix a fresh and inventive suggestion for the FoMA award. And the National Gallery is doing its job exceptionally well in making him the subject of this intelligent display. I fear the show may not gain the highest points on the blockbuster scoreboard. Delacroix’s greatest art cannot be shifted from the Louvre’s grandest gallery, and in any case, I don’t think it would actually fit in here. But the cunning deployment of his “followers” — Van Gogh, Gauguin and Cézanne, for starters — makes this an engrossing event. We begin with a vestibule that seeks to encapsulate the discoveries ahead: Delacroix in a nutshell. It’s one of those rooms that seems to point in so many directions at once, you’re not initially sure what to notice. Is that Rubens? No, it’s Delacroix. Is that Delacroix? No, it’s Sargent. Is that Cézanne? Yes, but it’s Cézanne inspired by Delacroix. Helpfully, the curators have colour-coded the labels, and once you realise that the red stripes mark the Delacroix works, and the white ones are everyone else’s, the show’s clever shape begins to emerge. See the handsome fellow with the floppy hair and the velvet collar — Hugh Grant in an Ibsen play? That’s Delacroix. It’s a marvellous self-portrait, borrowed from the Louvre, and its exciting mix of flamboyant surfaces with lots of darker stuff popping through is precisely what Delacroix brought to the party. I read that his Parisian nickname was “the tiger”. A crouching tiger, perhaps. Coiled and ready to spring. The organisers could not bring over his magnificent Death of Sardanapalus, one of the monsters in the Louvre, so a scaled-down version has to stand in. Sardanapalus was the decadent king of Assyria who wore women’s clothes and couldn’t decide which of the sexes he preferred. Delacroix paints him in his infamous last moment, when he orders the construction of a giant funeral pyre on which he will burn himself and all his possessions, including a beautiful blonde concubine who has been thrown, arms flailing, onto a gigantic red bed. There are fields of tulips in Holland smaller and less vivid than Sardanapalus’s red bed. It’s a mad storyline, typical of Delacroix in its lack of reserve. The brush strokes dash around like a pack of baying hounds. A football crowd of glistening slaves and nudes fills every inch of floor space around the insane Assyrian king. Many of the pictorial tricks have been learnt from Rubens. But the sense of a pressure cooker about to explode is a definite sign of the tiger. The show ahead has been divided into the various territories in which Delacroix and his passions influenced his successors. There’s a room for flower paintings; another for religious art; a third for landscapes. In all these genres, two qualities stand out — his paintwork and his hunger for huge meanings. Delacroix didn’t do half-hearted. When he painted a basket of fruit, he packed it with enough produce to cook a banquet. When he painted a storm in the Sea of Galilee, Christ’s bobbing boat is balanced as precariously on the giant waves as a Californian surfer. In everything he gives us, there’s a sense of moods being intensified and rules being rewritten. Compare the two well-dressed fellows who flank the opening doorway — a tall, thin full-length on the right, by Sargent; a tall, thin full-length on the left, by Delacroix. Sargent’s dandy is slick, polished, arrogant. Delacroix’s is awkward, wobbly, unsure where to stand. Sargent’s top-hatted lord has the inner life of a ship’s figurehead. Delacroix’s fellow is callow, nervous and fidgety. The most significant difference, however, is in the paintwork. Sargent’s is finished as smoothly as the hood of a Bentley. Delacroix’s human jalopy is formed out of lumps, bumps, stabs and smears. What fearless paintwork that is. 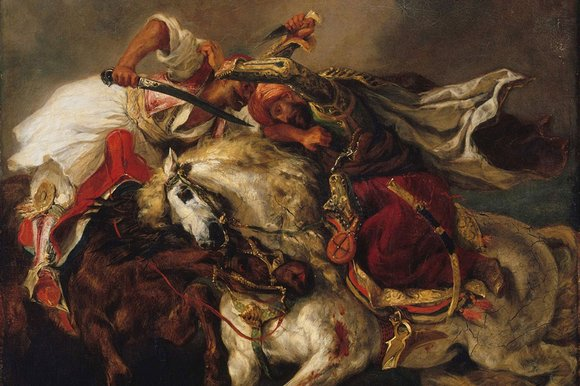 This fearless brushing turns out to be Delacroix’s most important gift to the future. And in a smart strategy, the curators use his followers to help us see this more clearly. Van Gogh was obsessed with Delacroix. So was Cézanne. So was Gauguin. So, amazingly, was Matisse. All of them pop up at intervals to make a point. When Renoir follows Delacroix to North Africa, in the exhibition’s travel section, and sets about painting the hazy vistas with brushwork that spits and sizzles like fat in a frying pan, you are encouraged to notice that Delacroix did it first. And yes, there is something spectacularly radiant and gorgeous about the multicoloured blossoms painted by Gauguin and Redon, but it was Delacroix who initially got drunk on flowers. We have an exhibition here, therefore, where the followers supply the wow factor, while the master sets the example. It’s a situation seen most obviously with the handful of Van Goghs scattered about the journey, which seem always to quicken the pulse more dramatically than the Delacroix paintings that inspired them. Particularly the stunning Van Gogh olive grove painted at Saint-Rémy in 1889, in which the yellow in the sky appears to have been mixed with the rays of the sun. What an exciting painting. Delacroix was crucial because he invented the passionate brush stroke, but it was his followers who freed that brush stroke from its prosaic descriptive duties. Delacroix himself could never do that. He belonged to a generation that didn’t trust the modern world to supply it with big enough subjects to go with his big brush strokes. For Delacroix, it was never enough to paint the sun above the olive trees: Sardanapalus needed to be burning in the grove as well. It’s a limitation. And, in the final count, it keeps him behind Courbet and Manet in the FoMA contest. But this excellent show deserves the highest praise for tiptoeing so cleverly to its conclusions.